The Canadian band brought the first full day of music to a close with an impressive set that covered their entire career. Opening with the title track of their latest album, Reflektor, the band performed hits such as Rebellion (Lies), Ready To Start, Keep The Car Running and No Cars Go, before climaxing with the moving Wake Up. Win Butler told the audience: "In a lifetime of near-impossible things that have happened to our band, this has to be the highlight." 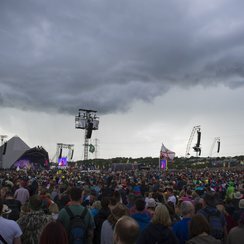 Earlier in the day, all stages were closed after a lightning storm made the site unsafe and reportedly hit the Pyramid Stage, meaning Rudimental's set was cut short. Music resumed around 7pm with Lily Allen. Meanwhile, Saturday night headliners Metallica were being helicopter on to the site as the storm broke. "It was kind of frightening," the band's Lars Ulrich told the BBC. "When we landed, all the people picking us up were going, 'We didn't expect you were going to fly in this weather'. "But the pilot didn't say anything about that. We saw the lightning up there. I thought it was pyrotechnics for Arcade Fire." Glastonbury continues today (28 June) with Metallica's headline set at the Pyramid Stage.